U.S. Sen. Cory Gardner is cosponsoring the single, most important piece of legislation we may have ever witnessed in our lifetime, and we urge Congress in the strongest of terms to ram this baby into law as soon as freaking possible. It’s the Telephone Robocall Abuse Criminal Enforcement Deterrence (TRACED) Act, and nearly the whole of the United States of America is a victim of this, the most annoying crime ever conceived. Coloradans have received these useless and oft times nefarious calls nearly 74 million times in the last two years, Gardner said. That’s 27 calls per second, 99,000 calls per hour, and we’re pretty certain that’s just to our cell phone. The law would also go after spoofers, which is doubly annoying when the phone rings with folks insisting you just dialed their number. 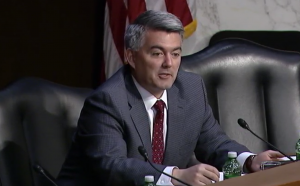 Click here to watch Gardner question witnesses on robocalls during a Senate committee hearing this week. “Robocalls are not only a nuisance, but they also pose significant harm to consumers, oftentimes with the intent to defraud or steal personal information. Amen, Gardner, stick it to ‘em!